A couple of weeks ago I was asked would I like to try out a Morphy Richards Soup Maker for review purposes. Even though space is at a premium in my galley kitchen, this appliance sounded very interesting and I decided to to give it a go. It’s like a giant kettle. In fact it’s twice as big as my regular kettle. Counter space is sparse and I wondered how on earth I would to keep the Soup Maker on the go, while juggling the hob as it seems the only spot suitable is on top of the hob. The lid is heavy and that’s because it has a stick blender attachment for “buzzing/whizzing” soups to your required consistency. There are 4 options and it’s all very simple to use. It even makes smoothies. Nice. Making soup was incredibly easy. Once I made sure to prepare my vegetables to dice size as per the manual, it was a case of popping the raw veg in, some stock on top and then selecting whether I’d like my soup to be smooth or chunky. Cleaning the Soup Maker was also a breeze, in fact I’ve started wondering what I did before we had one. One thing that I found brilliant about the Soup Maker was that I could stick it right at the back of the hob, turn it on and forget about it (also not worry about little hands with dials/knobs and flexes). We had hot soup after the school run on Monday, on Tuesday I made a broth then popped in some couscous while it was still warm. It was a meal in itself. It was so easy in fact that I feel like a bit of a fraud giving you this “recipe”! We’ve all come down with some form of lurgy or another. The last thing I want to be doing is slaving over dinner and we’re making good use of the Soup Maker. I picked up some butternut squash on special in the Grocer’s the other day, a few red onions, some carrots and some stock resulted in a fresh, smooth and velvety soup that I served inside a squash bowl for fun. No washing up. What’s not to love? Cut the butternut squash at the “neck” leaving the widest part of the squash behind (this also contains the seeds). Peel and chop all the vegetables into small, dice sized pieces. Pop all the vegetables into the Soup Maker. Crumble the stock cube into a mug and dissolve in hot water. Pour the mug of stock into the Soup Maker then top up with hot water to the “maximum” level in the maker. Plug in the Soup Maker, turn it on and select “smooth”. Press start. For the squash bowls, preheat a fan oven to 180 degrees Celsius, remove the seeds from the centre of the squash and wrap the bottom with greaseproof paper, then tinfoil to hold it in place, making sure that there is a large gap at the top. 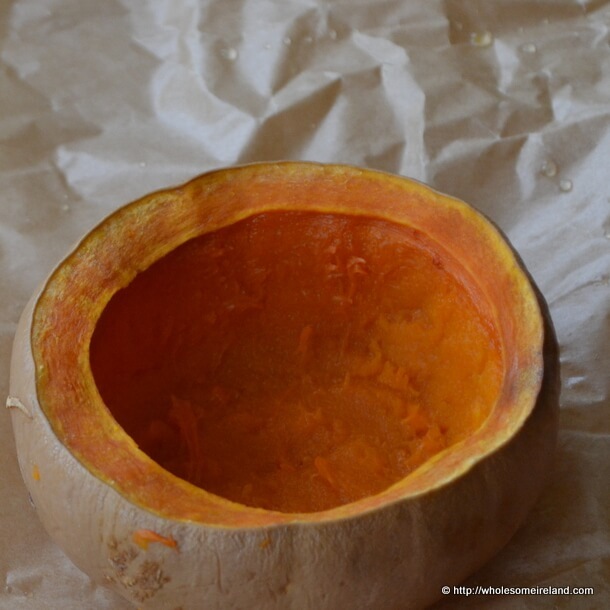 Put the squash on a baking tray and pour approximately 100ml of hot water inside the squash. Bake in the oven for 1 hour. After 1 hour the soup will have cooked, and cooled to an edible (non mouth scalding) temperature. 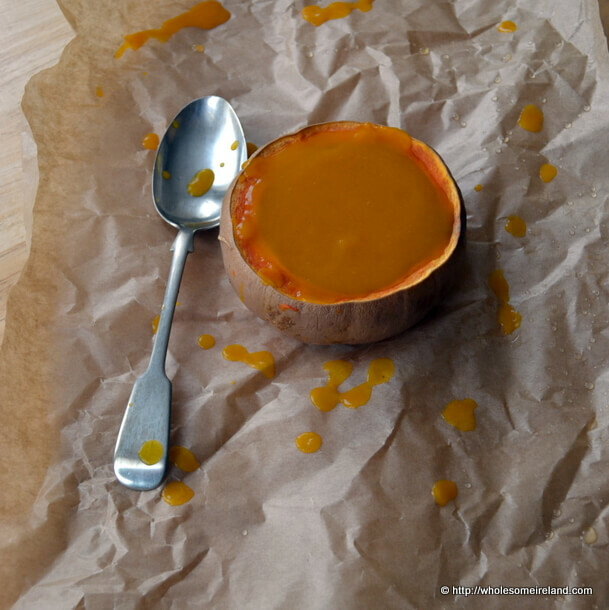 Spoon the soup into the butternut squash and serve. If you’re interested in getting one of these nifty Soup Makers for yourself, Morphy Richards have given me a unique code to get one at a discount: GH2255. The code will expire on 31st December 2013 and will allow you to get the Soup Maker for £44.99 (which is less than half the recommended retail price), all you need to do is click here and enter the code when checking out. 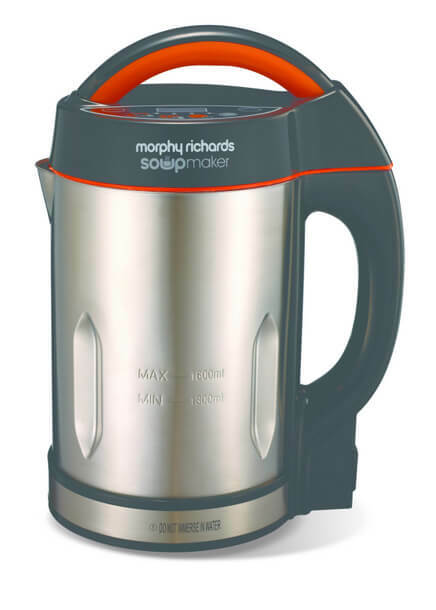 Morphy Richards have also given me a brand new soup maker to be given away to a lucky reader. Disclosure: I received a Morphy Richards Soup Maker for the purposes of this review and they have donated a further soup maker to give away to readers. My opinions are my own and I am not paid to give them. You may need a Parcel Motel account to accept delivery in ROI. Your fingers must be worked to the bone! Best of luck Mandie. Thanks Val. Best of luck! My family tell me I do a good week-end fry-up, but I’d love to wow them with some lovely home-made soup for the winter…this could be my secret weapon! Best of luck Lisa and thanks! Soup is such a lovely comfort food, don’t you think? That sounds like a cool piece of equipment I never knew you could even get a soup maker. It would be well used in our home. Hehehe N. It does make life terribly easy. I never knew such a thing existed. I love that it makes soup and blends all in the one container. One of the things I hate about making soup is the saucepans and then the blender, even the hand blender needs the soup to be in a jug, so this would definitely reduce on washing up. Yep me too Laura. It’s just so handy! I basically live on soup so this would be perfect for me! Quick and easy – what’s not to love?! Best of luck so Lucy! Nor did I! Best of luck Claire! While I love a decent fry-up you just can’t beat a great bowl of soup. Best of luck Jim! I never knew there was one either Dee. Best of luck! Perfect for winter walks Karen, you just pop it on and come back to great soup. What’s not to love? I’d never heard of one like this either and I’m certainly going to be using it loads in future. Best of luck! *sigh* I’m dreading it already… Best of luck Garrett! I’d like to try out a soup maker as I want quick, healthier, warming meals. They are certainly quick & healthy alright. Best of luck Maya! The soupmaker sounds amazing. So good to come home to a bowl of warm soup. Perfect for using all the veggies in the fridge. To start with I would make a creamy potato-leek soup. We eat so much soup in our house, this would be ‘souper’! Big soup fans in my house! Would love one of these! I’m trying to be healthier and think this would really help. It certainly would, best of luck Emma! i would like it so i could give it to my mam(carol muldoon) for the reason she stated! (yes she is that bad,)!! Also it would give my poor aul dad a break! Oh dear, best of luck to your mam so! Hahahah “without the burned bits” good luck Carol! Making it this way certainly isn’t a chore. Best of luck Jen! Potato-leek soup sounds fab, it’s on my list of to-make ones in the next week. Best of luck Annetje! *groan* so many soup puns, so little time! Best of luck Gerry! I think if you got them involved it’d be a fantastic idea. Best of luck Kathleen! Have you seen the price of a Thermomix? Yikes! This is definitely much cheaper. Best of luck! I’m a huge fan of their products I have to say. Best of luck. Always have a pot of soup going during the winter – various veggies as I think it’s a great way of getting the family to have their 5-a-day. Grated ginger would be lovely in this recipe. Great idea Jinger. I love gadgets too. Wish I had space for more of them! I;d love to try one out as I make all my soups from scratch since loosing my weight, I wouldnt dare touch a carton or tub now, this would be so much easier and quickly than the pot and hand blender. Best of luck & congratulations on losing your weight. I love to make soup but it is quite time consuming a soup maker sounds so much quicker and it does it all for you which is an added bonus!